It’s the season for truffles and what better way to celebrate it than to have a truffle and cheese fiesta. But hold your pigs because you won’t be needing anything to hunt down these seasonal beauties. Just you and your appetite. Luckily, The Gazebo has done all the hard work for you and created that heavenly truffle and cheese pairing into a degustation. So forget early morning foraging for these treasures, and instead get yourself out to The Gazebo. 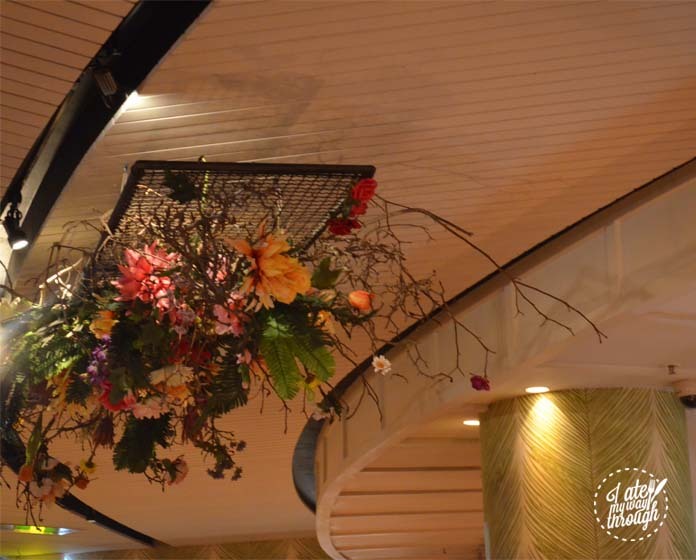 This five course degustation will have your taste buds journeying through dishes of truffles paired with a variety of cheeses and it all comes in multiple forms. Expect to see it shaved, grated, infused and even finely sliced. As a first time truffler, this is exactly the kind of taster I needed. 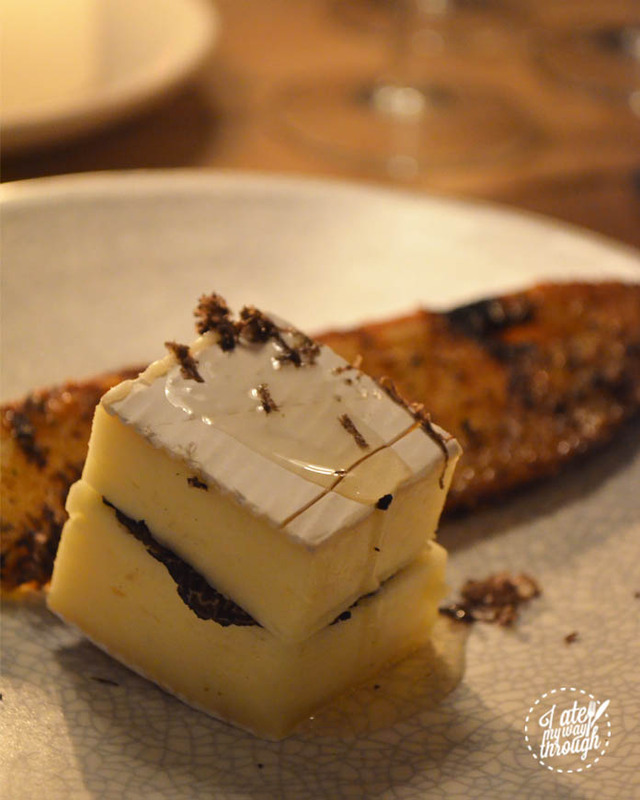 The first course was a piece of truffle honey-seeded toast sided with Brie Mon Pere, which had thin slices of truffle placed in between. This was a great starter for an inexperienced truffler like myself. The Brie was soft and creamy which married well with the truffle’s earthy flavour. Together with the honey and the crispiness of the seeded toast, the dish came together beautifully easily reaching all parts of the palate. This sweet savoury dish tasted amazing with the white wine pairing. The first course had me on board the truffle train immediately and I couldn’t contain my excitement for the next dishes to come. The second course was Burrata, beets, heirloom tomatoes, asparagus, basil, balsamic and grated truffle. After the sweet and savoury characters of the first course, the second course turns 180-degrees with a burst of different textures and tastes. 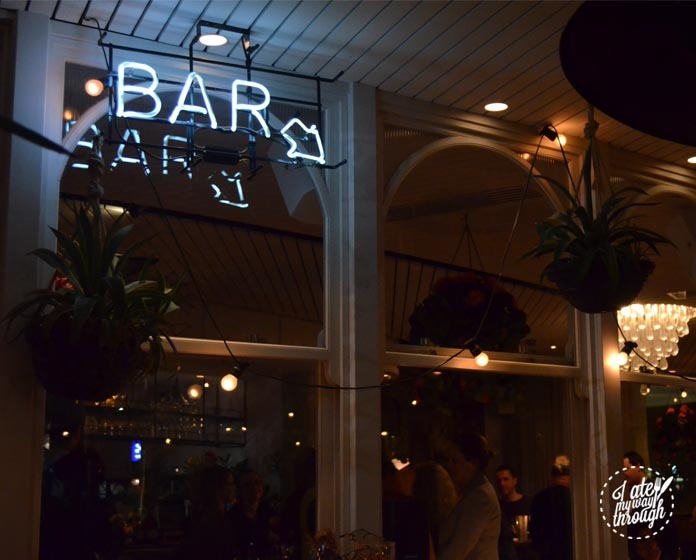 If the first course were a warm winter night by the fireplace, then the second course was surely the cool summer breeze. 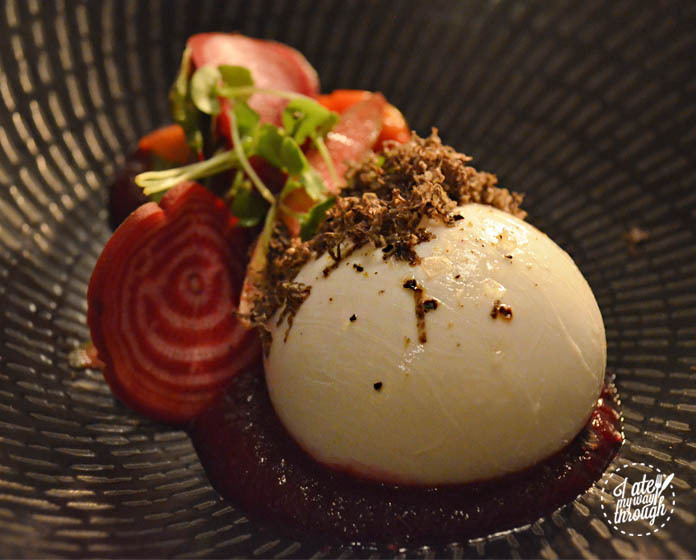 The Burrata was cold and creamy and upon the first slice and quickly oozed into the juice of the beets and tomatoes, which dyed the cheese cream pink. Together with the earthiness of the shaved truffle this course was just like a little spring garden with flowers blooming before your eyes. 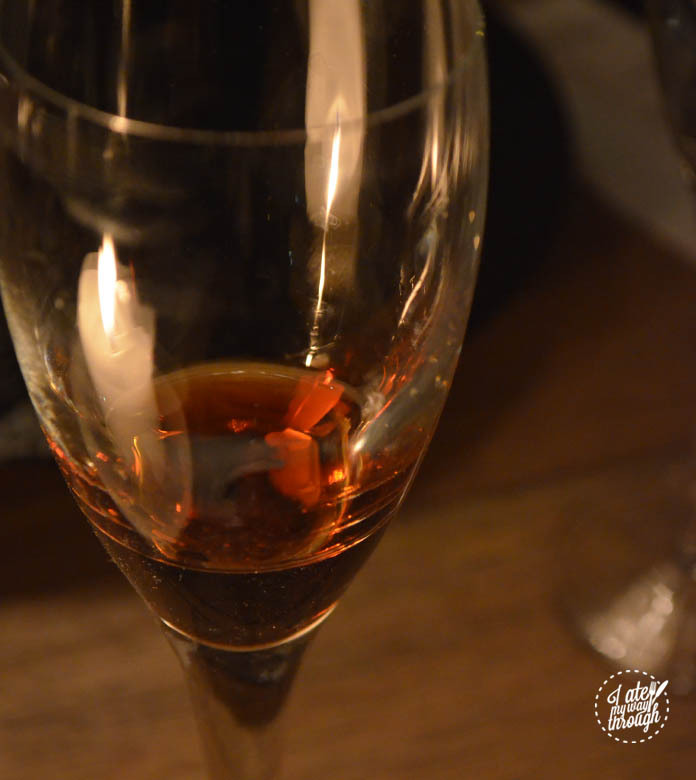 The refreshing taste helped to cleanse the palate for more full-bodied flavours to come. 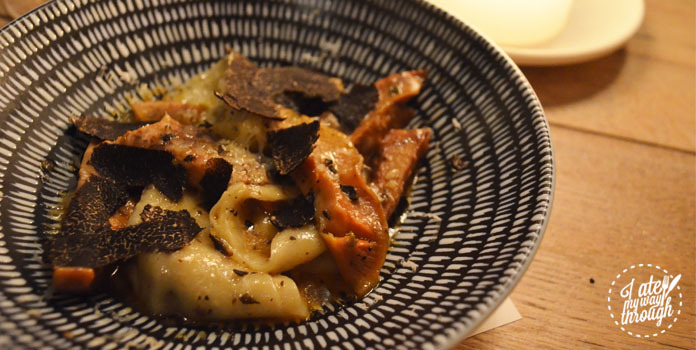 The third course was made of all your mushroom dreams: a mushroom tortellini, wild fungi, shaved truffle white wine sauce and truffle pecorino. As it was being set down onto the table, the scent of the pecorino and the truffle quickly filled up the air. The mushroom tortellini and the truffle white wine sauce gave this dish a rich quality which paired well with the red wine. Be prepared, this one really was a delicious punch of cheese and truffle to the senses. 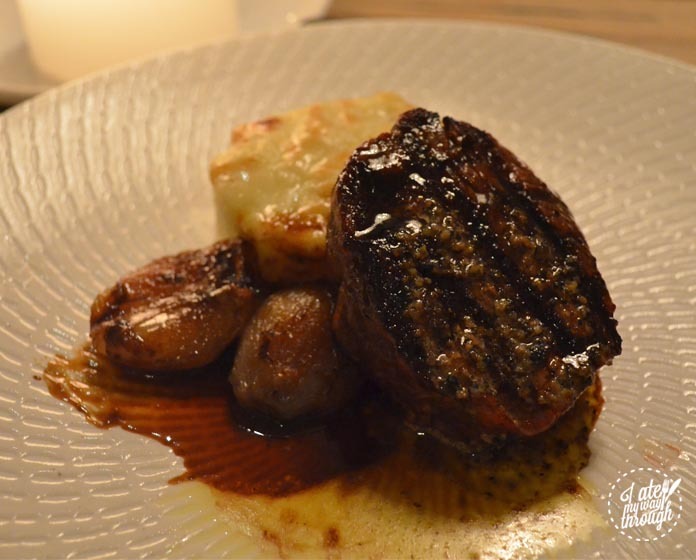 The fourth course was the eye fillet crusted in truffle salt, roasted eschalots, cauliflower & cheese bake, red wine jus and of course, truffle. The eye fillet was cooked to a perfect medium rare and the truffle salt added more texture to each bite. Unlike the tortellini dish, the truffles weren’t as overwhelming. The meat was well established amongst the other components in this course and the cauliflower & cheese bake was a great carrier for all the flavours. A glass of red coupled wonderfully with the eye fillet and bake. This five course degustation began on a high and ended with one too. 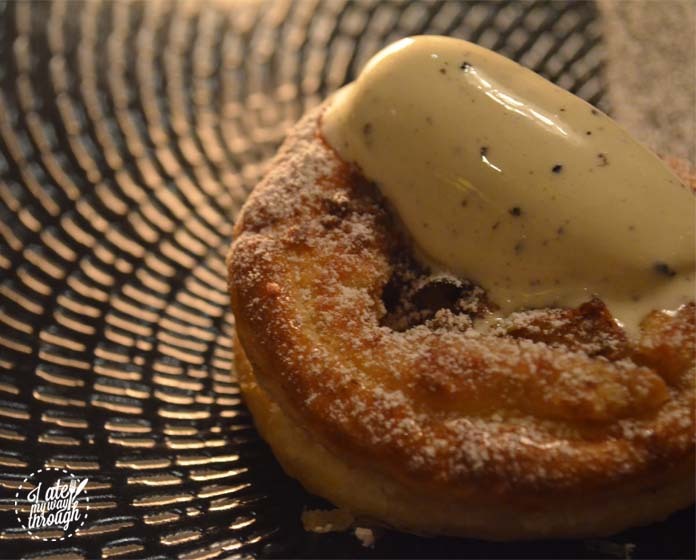 Dessert was a warm apple galette, frangipane and truffle ice cream. I have to admit, my initial feelings about truffles in ice cream weren’t pleasant. 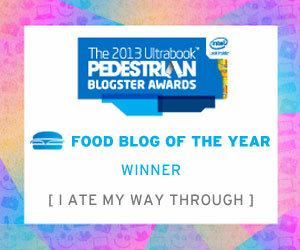 I had expected it to taint the creamy sweetness of what I know ice cream to be. But for those of you who know the magical powers of the truffle, this ice cream could have easily been the best part of the degustation. Not overly sweet nor overly truffle, the ice cream along with the warmth of the tart was more delightful than I could have imagined. If you thought it couldn’t get any better than that, the flavours of the apple in the galette were heightened with Campbells Liquid Gold wine pairing. 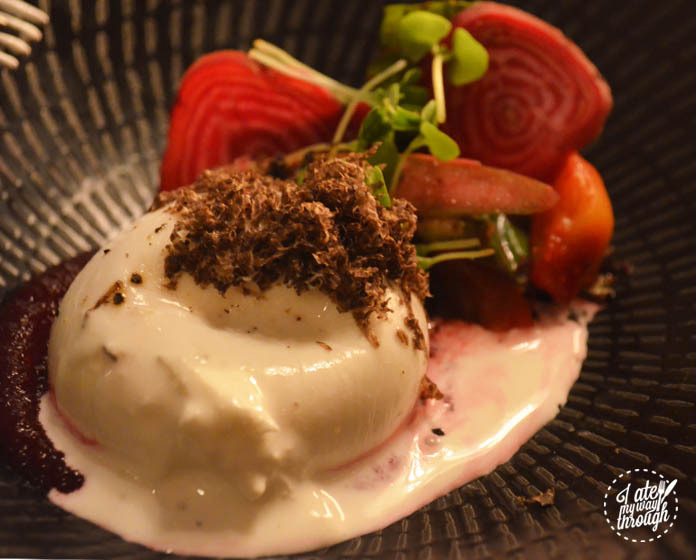 Whether you’re a first time truffler or well versed with knowledge on this fungi, this 5 course ‘dego’ by The Gazebo Sydney is a great exploration into everything that truffles and cheese could ever dream to be. The self proclaimed 'Indiana Jones' of foodies, Stoney is never one to shy away from a challenge. And by challenge, she's talking about the newest and hottest foods. Being born with the heart of a city girl but raised on her parent's homeland cuisine (Cambodian/Vietnamese), her favourites are modern takes of traditional dishes that bring out new sensations and experiences from classic tried-and-true recipes. With tastebuds that are always searching for new things to eat, Stoney isn't the type to eat the same thing twice in a row. Unless it's really really good. Then maybe.